A certain amount of lawlessness prevailed. An 1876 Wild West-type shootout was spurred by an argument among neighbors over something Westerners still haggle about today: water. Threats of Indian attack loomed. Breaking ground and clearing the land for farms was difficult work with uncertain rewards. Stay tuned for the shootout story in an upcoming chapter, but let’s first look into what brought white folk to Southwest Colorado. Prospectors first began arriving in the San Juan Mountains around 1860-1861. The Baker party, which established a camp around Bakers Bridge at that time, is the most notable of these. Charles Baker believed there was gold to be had in the San Juans, and he spread the word. Portrait of Native American Utes and whites in Washington D.C. after the Brunot Agreement was signed, giving miners access to the San Juan Mountains. Front row, left to right: Guero, Chipeta, Ouray, Piah. Second row: Uriah M. Curtis, Major J. B. Thompson, Gen. Charles Adams, Otto Mears. Back row: Washington, Susan (Ouray’s sister), Johnson, Jack and John. Photo courtesy Western History/Genealogy Department, Denver Public Library. The Treaty of 1868 established a reservation for the native Utes that encompassed most of the western third of Colorado. It was technically not open to white miners, but they came anyway. The white men discovered some minerals worth extracting, and the federal government was interested in helping them procure those precious metals. This was not good news for the Indians, who would be pushed elsewhere once more as the European-heritage settlers inexorably filled in the West. The federal government negotiated with the Utes to allow miners into the San Juans. The Brunot agreement, signed in October 1873 in Washington, D.C., and passed by Congress in April 1874, allowed the miners access to the San Juans. The agreement, however, only temporarily calmed matters, according to A Colorado History, co-written by Duane Smith, longtime Fort Lewis College history professor. The Indians weren’t totally convinced that they’d also given up the valleys in the 4 million acre “San Juan Cession,” but the documents showed they had. The miners kept coming and establishing camps and towns. The San Juans saw a rush that led to the establishment of many towns in 1874 and 1875, including Silverton in 1874. Animas City was platted in 1876. As miners and their families moved into the area, the Brunot agreement failed to hold. To make a convoluted story short, by the early 1880s the Utes were all but gone from the mining area, some pushed into Utah and others confined for the most part to their present-day reservation land. Meanwhile, settlers had arrived in the Animas Valley by 1874, generally via Silverton. Among them were Mr. and Mrs. Hugh Lambert, who, accompanied by three sons, Richard, Louis and Riley, had settled at Waterfall Ranch. Mrs. Lambert was the first white woman in the valley, according to Martha A. Roberts’ account in Pioneers of the San Juan Country. Martha, who arrived in 1875 with her husband and settled north of Hermosa Creek, was the second woman in the valley. For the last link of the journey over the mountains, Martha rode horseback using Candacy Lambert’s side-saddle, which had been brought for her from the valley. Martha’s trunk was transported by a pack train. The final two days from Silverton to Hermosa were at times harrowing, the horses going carefully up and along “shaley” mountainsides. When Martha arrived with her year-old son at Hermosa, she found that her husband, Augustine, had already built a cabin, with a puncheon floor (split logs flat on one side) covered by wild hay and a carpet. Some of their household goods – stove, cooking utensils and bedding – had already been brought in by a horse team lugging a “heavy road wagon.” Martha also found that Augustine had set up the stove, arranged furniture he had made, and put the dishes neatly in a rack in the corner of the cabin. 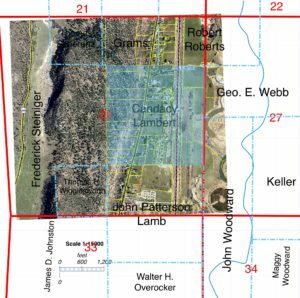 The original Lambert homestead (shaded area) is overlaid on a present-day overhead photo. In August 1875, “Mr. and Mrs. William Webb arrived in covered wagon drawn by oxen,” Martha wrote. The Webbs settled on the east side of the valley, across from Waterfall Ranch. In October, Mrs. Webb gave birth to William Webb Jr., the first white child born in the valley. Martha Roberts and Mr. Webb delivered the baby. In November 1875 came the first trouble with Indians, Martha recalled. Ignacio, the Southern Ute chief, along with other chiefs and their wives, “called on every settler and ordered them to leave that night.” The Utes may have thought that the Brunot agreement would keep the settlers in the mining areas and out of the valley. They might have been correct, but the settlers were persistent, and they didn’t obey the Utes’ order. Many Indians, Martha said, were friendly, and often would roam the valley, sometimes begging for food and supplies. A fear of encounters led to the establishment of Camp Lewis in 1878 at present-day Pagosa Springs. Camp Lewis was moved in 1880 to a site south of Hesperus, known as Old Fort Lewis. Another Indian scare occurred in the Animas Valley in the spring of 1879. The men of the valley erected a sod fort on the Gaines ranch and stood guard for several days, Martha Roberts said, but nothing happened. It was an exciting time, and the land was filled with people having made their way West, seeking opportunity in the wide open spaces. It was also a dangerous time. Colorado wasn’t lawless but was still just a territory. You had to watch your back. Indians were still considered a threat to the white settlers. But the biggest threat was often disagreeable neighbors. The next Waterfall Ranch story, one of deceit, death and revenge – it even involves a posse! – is among the latter. A Colorado History, published 2006, Carl Ubbelohde, Maxine Benson and Duane A. Smith, p. 176. 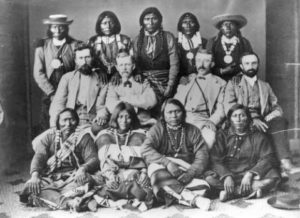 Pioneers of the San Juan Country, Vol. 1, pp. 48-54, account by Martha A. Roberts, written in 1936. Colorado Weekly Chieftain (Pueblo), July 13, 1876. Saturday, June 17, 2017. For more, click on "Celebration" tab above! Click on "history" tab above to read about all the people and events that made Waterfall Ranch what it is today. Want to know more about Animas River Wetlands? Click on the "Wetlands" tab above to visit the website.